Just imagine! There I was in a classroom sitting next to Linda Newbery, with Frank Cottrell Boyce and Beverley Naidoo rushing in late (and without a reservation, I believe), sitting down at what they soon named the ‘naughty table’. In fact, Frank continued looking slightly naughty throughout the session with our ‘teacher’ Bali Rai. Our workshop had the fancy name ‘The Importance of Identity and Race in Young People’s Fiction’, but Bali called it Diversity. I’d like to think that our room was so crowded, because it was the best of the workshops. I was somewhat dubiously placed, sitting right underneath a photo of the recently departed President Bush, but then Obama was there, too, and Yeltsin was nearby with Gorbachev. I’m full of admiration for Bali’s powers. When the session began it started raining fairly heavily. Before long we had a full-blown storm with thunder and lightning and rain cascading down from the gutters outside the window. Very dramatic. It ended when the workshop was over. As so many people on Saturday said, Bali reckons he wouldn’t be where he is now without the library. Books were a precious thing for someone growing up in a one-parent family with little money. If he’d asked for pocket money he would have had to go without food instead. Bali feels that to get ‘minorities’ to read you have to start by putting them in the books. When he talks about minorities he doesn’t just mean poor immigrants; it covers anyone who is different in some way. One of his most favourite books recently was The Curious Incident, so he and I are clearly on the same Aspie wavelength. His local library in Oadby, Leicester, is ‘brilliant’, and seems to do all that Bali wants from a library. He tells of the father who comes in to use the computer, and whose daughter learns to look at books while her dad goes on the internet. So in effect the girl becomes a reader simply because they don’t have a computer at home. The reverse can also be the case; with library staff putting adult books near parents who bring their children in for various child sessions. It’s a case of catching people where you find them. Libraries need to shout ‘we are here!’, so prospective users can find them. Another thing Bali has noticed is that as soon as you have a book about a single parent, they are immediately labelled ‘issue novels’. He himself has a book on a recommended reads list for schools, which he is pleased about, but also annoyed, as it comes under ‘reading about other cultures’, when Bali has written about life in Britain. So if it’s about people with another skin colour it automatically turns into ‘other cultures’. He also mentions schools which shadow the Carnegie, where books on the shortlist can be too inaccessible for keen but less able readers. There needs to be alternate lists of books. Bali’s most recent novel is a mirror image story, about a white boy who is in minority, and is bullied by a group of coloured boys. His next one is about non-white British soldiers in World War I, something that comes as a surprise to people who think that British soldiers always are white. Publishers need to adapt and publish more ‘minority’ books or they will soon not have any readers left. And it could be a good idea for bookshops not to treat prospective customers as hooligans just because they are young, male and non-white. They might just still want to read, and even buy, a book. Or two. Thank heavens for people like Alan Gibbons. Someone who not only thinks that things are wrong, but who does something about it. I have barely had time to take in all his emails and newsletters this winter, let alone act on them. Just imagine how busy Alan has been; writing, digging, travelling. Possibly even doing some writing for himself once in a while. Must find out. So, after the lighter introductions, we settled down to more serious things. Question Time with the politicians, except we ‘only’ had Ed Vaizey and Richard Younger Ross, because Lyn Brown had been promoted to the Whips office during the week, and in this mad world that means she can no longer say in public what she thinks about a subject she is very interested in. A lot was said by those present, but whether any of that will ever happen is anybody’s guess. The panellists had reasonable ideas, but they would, considering the circumstances. The audience had lots of questions and ideas, and we could have gone on forever. 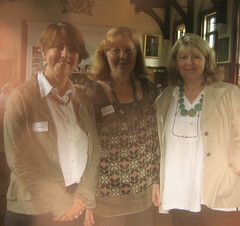 After lunch it was time for two wonderful talks by the librarians who have been in the centre of the storm, so to speak. Clare Broadbelt, who was made redundant when her school library was closed, spoke eloquently on what it had been like both before – when things were normal – and during the period leading up to the closure. It was a good thing to hear how many of her pupils had spoken up. They had started petitions, only to find them torn up and told they were rubbish. And the reading room that had been promised in place of the library has not materialised. The second talk was by Cath McNally, librarian from the Wirral, where they have an awful lot of millionaires, but also a great deal of child poverty. If all librarians can speak as well and as touchingly as Cath did, then we have much to be proud of. She cried at the end, describing how ‘her’ children had recommended books back to her, which just goes to show how much influence the library has had. I wonder if the suggested small stock of books in the GP’s surgery will have quite the same effect? Gillian Cross spoke about her use of the mobile library, both forty years ago, and now, noting the changes in needs. The difference is the internet and as she said, the old ways won’t be coming back. Miranda McKearney from the Reading Agency and Marilyn Mottram from the UK Literacy Association spoke about their findings from experience and research. According to Marilyn there is plenty of money out there; we just need to look for it in different places. Martyn Coles, head teacher at the City of London Academy, is unusual in his love for libraries in schools, and he reckons that architects need to be pushed in the right direction by caring head teachers, if new schools are to be built with sensible libraries. Frank Cottrell Boyce told a long and funny tale about his daughter’s tin whistle ‘lessons’, which was a random way of describing how anything that is good should be taught. You share, rather than teach. 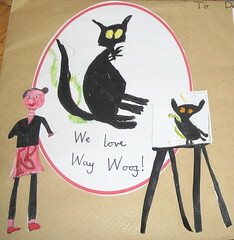 He had had a recent bad school visit, which convinced him of how books should not be treated in schools. As Frank pointed out, his own father had taught him a love of football by playing it with him, not by turning it into lessons. One of Frank’s daughters who is not into reading, had been given Northanger Abbey on her iPod. Apparently Austen doesn’t work so well on shuffle, however; you just don’t know who is married to whom or for how long. 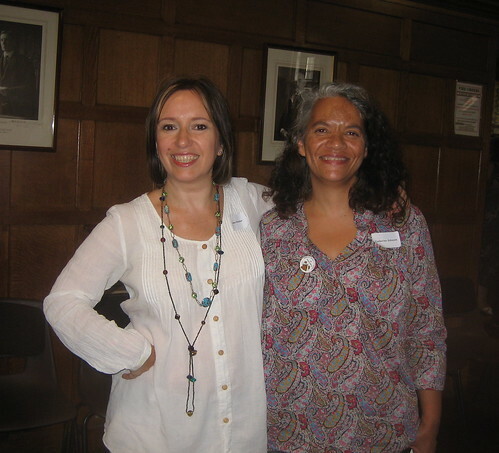 As I usually seem to do, I ran into Fiona Dunbar in the Ladies at the start of the proceedings of the Campaign for the Book. Since this was held in the impressive King Edward School in Birmingham, which is a boys’ school, we have to be grateful for there being facilities for us girls at all. And while in toilet mode, I may as well admit to ending the day in the Gents, where the lone male customer was showing considerable courage in the face of so many women invading. Having spent a whole day looking into the future of libraries in schools there is a lot of stuff to tell, so let the number one in the title be a warning that I will not disclose all right now. In actual fact, having begun by not being serious, I may as well continue not being serious. I had a surprisingly easy journey, only getting a little lost cutting through Birmingham University. 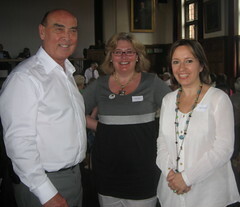 That is despite the great help from that super-organiser Jean Allen, librarian at KES. Beautifully visible in cerise, and with a beautifully audible voice – so many people whisper, you know – Jean masterminded a first class event. Lots of food. Good food. Things worked. I have always wanted to write the words stone mullioned windows. There! I have done it! They had them, you see. Great Hall. The school’s Chief Master (what a title!) spoke. He’s a former pupil, along with his mate Lee Child (who I distinctly remember saying a few years ago that he had had an ordinary English school background…), and he was suitably amusing before leaving in order to stop his son setting fire to their house. Or maybe that was a joke. It’s fascinating with events where the authors are mainly in the audience. I have only listed the ones I know and recognise, although the list provided had more people on it. (From an alibi point of view I don’t want to state that X was there, in case he wasn’t.) Was pleased to discover Theresa Breslin was on the list, and worked hard at deciding what she might look like. She was, of course, the one sitting to my left. Alan Gibbons is the driving force behind the whole campaign, so he was there. Celia Rees had a speaking role, and so did Gillian Cross. Steve Skidmore kept people in order during one discussion, and Beverley Naidoo and Frank Cottrell Boyce ended the day. We had two sittings for lunch, and if I say that I first lunched with Theresa Breslin and later with Fiona Dunbar and Lucy Coats, you’ll wrongly assume I ate twice. I just didn’t leave when I should have, since it was so nice to finally meet Facebook friend Lucy. Most of the 200 conference goers were librarians and others similarly occupied. And not a single Gudrun Sjödén stripe in sight. With so much on the programme I was amazed to find we finished on time. I had done a little autograph hunting during the day (my bag would have been a lot lighter with fewer books carted round), and then I finished off the day’s hunt by catching Gillian Cross and Beverley Naidoo as they were leaving. The Haggis-knee played up on the way back through the university, so some hobbling was engaged in, and I was overtaken by loads of librarians. Like the famous tortoise however, I caught the train and they didn’t. Ticket issues, I believe. Found Beverley Naidoo again at New Street station, where I was also offered a Malteser by polite young Muslim man. All in all, very nice. 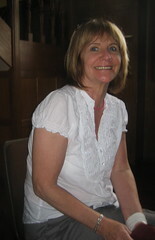 I was contacted a while ago by Sue Birch, who has written a short children’s crime story called Dead Puzzling. It has an Asperger theme, so I was interested, and as I’m always keen to promote anything suitably Aspie, I said Sue could send me her book. It’s doubly worthy in that she donates half of the profits to the National Autistic Society. Sue was wondering if the book would be right for children with Asperger Syndrome, which is actually harder to say than you’d think. I don’t know. Two years ago when I wrote about Aspie books I only thought of spreading the word to the neurotypicals in this world, but then I found that Aspies are, understandably, looking for fiction featuring people like themselves. But short of testing any book on a large scale, I can’t say. It is good that there are books about Aspies. I think that older Aspies need books, but younger ones may well not. Sue reckons her story is suitable for ages eight to thirteen. I’d say more like seven to ten or eleven. It’s a young theme, albeit using slightly old language. It’s obviously set today, but has a flavour of the Blyton era. Dead Puzzling has been self published, I think, and it could do with more editing, but the Aspie aspect (sorry!) may not always appeal to regular publishers. The story is partly about illegal immigrants, and this bit of it feels a little too politically incorrect for today’s readers. There is a dead body in the cemetery, and three young children try to solve the murder. One of them has Asperger Syndrome, but seems not to know it (although he is miraculously diagnosed in the course of the book). He sees what his normal peers do not, so helps solve the mystery with his special ‘powers’. The Dad is also very Aspie, but that fact goes almost unmentioned. It’s fun to see though. I’m really, really pleased that Siobhan Dowd has won the Carnegie medal for her third novel, Bog Child. As I said a couple of months ago, the shortlist was a particularly good one, but I do have a special place in my heart for Siobhan. And I hope all the other shortlisted writers can go on and win the Carnegie another year. I didn’t know this, but it seems they haven’t had a posthumous Carnegie before. There’s been a lot of celebrating by Siobhan’s friends over on Facebook, which just goes to show how much everyone cares. And David Fickling has even turned to blogging, which must prove something. 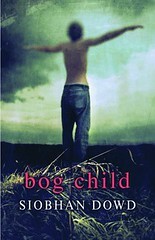 If you haven’t read Bog Child; why not? Go and do so now. Might as well give a copy to someone you like, too. Or two. I have actually taken longer over an interview, but only once, and only just. It was great fun, though. Not the getting more and more delayed, but the writing. The Resident IT Consultant is racing to finish reading the last Pure Dead Magic, and keeps harking on about it being for adults, really. So? I was talking to some library people in Preston at the weekend, and not surprisingly they try to fit in a little adult reading on holiday, since they are honorary teenagers the rest of the time. I would never leave my young books behind when I go away, but do admit to a higher proportion of adult crime for holidays. Not that they are holidays, really. I seem to blog ‘all day long’ wherever I am. So, I managed two grown-up crime novels on this latest trip. Roman Ruso I have already told you about, and in the same place as I found Ruth Downie, I also came across Adrian McKinty. I never ask for books for birthdays now, since somehow I don’t seem to need any extra ones, but I did this year, since I was wanting to catch up on Adrian’s books. The dutiful Son has taken it upon himself to provide. First, then, is Hidden River, and like Fifty Grand it’s mostly set in Colorado, but for all that it’s pretty Irish. Write about what you know is an apt description, since it’s about young man from Carrickfergus ending up in Colorado, and with a little Oxford in the background. Sounds like Adrian himself, except I don’t think he is a disgraced ex-policeman with a drug problem. Alex Lawson is, however, and he ends up in Colorado trying to solve the murder of his ex-girlfriend Victoria, while looking for heroin to take care of his daily needs. The wealthy, wannabe politician’s set in Denver is not a nice place to be, but everything points in this direction. Interestingly, Adrian tells the reader who ‘did it’ fairly openly, and you get early notice of when people are going to die, or that things will go dramatically pear-shaped. That doesn’t remove any of the suspense.